Adding an exercise ball to your golf strength training routine is a great way to not only break out of the monotony some of your more familiar exercises, but it is also a great way to prepare for golf. You can target all of the key areas that you would with a traditional strength training program, but the instability that an ball provides will help with all sorts of tiny muscles you didn't even know that you had! One of the great aspects of using a ball as part of your training is that it transforms any stability ball exercise you perform into a core exercise. Even doing something as simple as replacing your office chair with an ball will help improve posture and strength. One of the main components of the golf swing is trunk rotation. If your back is not properly prepared to handle a large amount of forceful rotation, the risk of injury is significantly increased. There are numerous core exercises that can be performed using a ball to strengthen your midsection and help provide stability throughout the golf swing. When looking to purchase a stability ball there are a few things to consider. One of the most important things is the size. A very general guideline to follow is a simple sit test. Sit on the ball and take note of your hip and knee position. Both your hips and knees should be at 90 degree angles. General size guidelines are 45 cm ball for 5'0" and below; 55 cm ball for 5'1" to 5'6"; 65 cm ball for 5'7" to 6'; 75 cm ball for 6'0" and above. There have been some instances of balls exploding under pressure so be sure to check if your ball is burst resistant. The chance of that happening is pretty rare, but it definitely has occurred and can lead to serious injury. 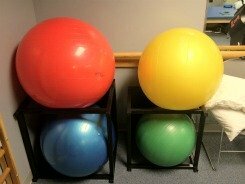 One more thing to consider before buying a stability ball: they are all not created equal! This is a difference between a ball that you will find at a therapy clinic or gym, and one that you will find at a discount store so do some homework first! Also, I have an entire page dedicated to my favorite Golf Fitness Products. Please follow the link to check out the page. So where exactly do stability ball exercises fit into a golf fitness program? They are so versatile that you can use them not only during the stabilization phase of your training but throughout the strengthening and even power phases. The stabilization phase focus on relatively simple motions, however, they are made more challenging by adding the factor of instability. Examples of pure stabilization exercises would be: seated biceps curls on the ball, overhead press on the ball, or bridges using the ball. You can even use them as part of your flexibility program. The ball will provide you a great stretch for your lats and hip adductors, just to name a few. So please check out the pages below for numerous options to add to your training program! Do You Want More Strength, Power, and Endurance for Golf? 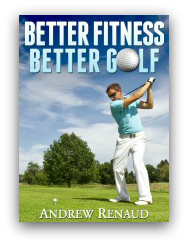 My comprehensive e-book, "Better Fitness, Better Golf", will show you exactly, step-by-step, which exercises to perform and when! It's a complete training regimen leading you through all phases of the golf season. Free Shipping On Orders $75 Or More at Golfsmith!